Hip 196, a Medaglia d'Oro colt, hammers for $1.35 million at the 2018 Fasig-Tipton Saratoga Selected Yearling Sale. The biggest Fasig-Tipton Saratoga Selected Yearling Sale catalog in recent memory produced the highest gross in the elite auction's history and tied the record median sale price, powered by a fervor in the marketplace for offerings by Medaglia d'Oro and American Pharoah. The two-day auction moved 170 horses for record revenues of $62,794,000. 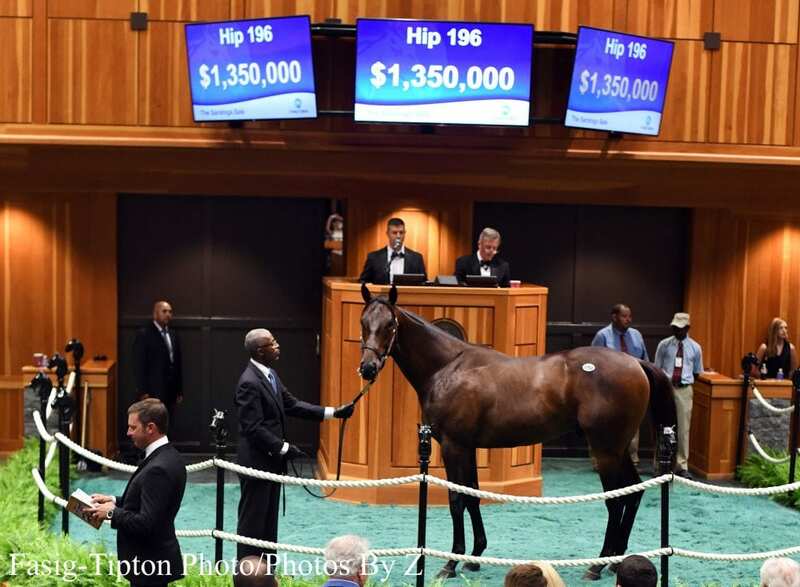 That figure surpassed the previous record of $62,412,000 set in 2001, and marked an 18 percent increase from last year's figure of $52,995,000 from 156 horses sold. The average sale price rose 9 percent to $369,376, the second-highest return in the auction's history behind the 2001 renewal, which finished at $385,259. The median of $300,000 tied the all-time high set last year, while the buyback rate of 21 percent was a fairly steady return compared with 20 percent in 2017. Though the results stood up to the previous high-water marks set in 2001, Fasig-Tipton president Boyd Browning said this year's sale took a different road to get to get there. Browning also credited the work of late company vice president Bill Graves, both physically in his work putting together the Saratoga catalog prior to his death, and perhaps spiritually. The public demand for sons and daughters of Medaglia d'Oro hit a fever pitch on Tuesday, with all three of the evening's seven-figure horses being sired by the Darley roster member. A $1.35-million colt topped the sale, going to the partnership of West Point Thoroughbreds, Robert Masiello, Chris Larsen, and Siena Farm. The new ownership on the sale-topper is a tangled web of prior partnerships. Masiello was once a West Point investor before branching out on his own. He, Larsen, and West Point campaign Grade 3 winner Berned together, while Anthony Manganaro's Siena Farm was part of the group of owners that campaign Kentucky Derby winner Always Dreaming with West Point. Their purchase, Hip 196, is the first foal out of the G3-placed stakes-winning Wildcat Heir mare Coco's Wildcat. Champion Songbird, also by Medaglia d'Oro, is in the extended family, along with G2 winner Ivanavinalot and G3 winners Friel's For Real, Ryan's For Real, and Mico Margarita. Taylor Made Sales Agency consigned the colt, as agent. Phoenix Thoroughbreds scored the next big Medaglia d'Oro yearling, Hip 204, a half-sister to Preakness Stakes winner Exaggerator, for $1.3 million. Trainer Steve Asmussen signed the ticket for the operation after outbidding the Godolphin team, which was going for one by their own sire. The dark bay or brown filly is out of the stakes-placed Vindication mare Dawn Raid, who is the dam of four winners from five foals of racing age. Canadian champions Embur's Song and Eternal Search can be found on the page. Amer Abdulaziz, founder of Phoenix Thoroughbreds, said the filly was the one they had targeted out of the sale, and he was willing to go higher to get her if he had to. Warrendale Sales consigned the filly, as agent. Roy and Gretchen Jackson's Lael Stable struck the first seven-figure blow during Tuesday's session, going to $1 million for Hip 143, a Medaglia d'Oro filly. The purchase will lean heavily on a pedigree cross that has already succeeded wildly. The filly that sold Tuesday is the first foal out of the winning Distorted Humor mare Veracity. Her second dam is the Grade 2-winning A.P. Indy mare Yell, whose produce record is highlighted by another Distorted Humor daughter, the stakes winner Cheery, who is herself the dam of multiple G1 winner Elate. Jackson said the filly would eventually go to trainer Arnaud Delacour when she began her on-track career. The filly's extended family includes G1 winners Sea Hero, Hero's Honor, and Eastern Echo, G2 winners Wild Applause, Glowing Honor, Roar, Congrats, On Leave, Norumbega, and Ironicus, and notable sire Flatter. Indian Creek consigned the filly, as agent. Tuesday's closing session proved to be the stronger of the two days, finishing with 87 yearlings sold for $33,829,000, up 18 percent from last year's finale when 81 horses sold for $28,570,000. The average rose 10 percent to $388,839, the median jumped 17 percent to $350,000, and the buyback rate was 20 percent. All four figures were improvements from Monday's session. A pair of offerings from the first crop of American Pharoah dominated the opening session on Monday, led by Hip 26, a filly by Grade 1 winner Life at Ten who sold to Larry Best's OXO Equine for $1.2 million. The half-sister to G2-placed Singing Bullet was another successful weanling pinhook for Brian Graves of Blue Sky Stables, who bought the filly for $500,000 at last year's Keeneland November Breeding Stock Sale. Gainesway consigned the filly, as agent. Later in the night, trainer Bob Baffert signed the ticket for Hip 62 on behalf of M.V. Magnier of the Coolmore partnership for $1 million. Baffert trained American Pharoah during his on-track career and the horse now stands at Coolmore's Ashford Stud in Versailles, Ky. The New York-bred colt is out of the Touch Gold mare Party Silks, making him a half-brother to G2 winner Upstart and stakes-placed New York Hero. Summerfield Sales consigned the seven-figure colt, as agent. This entry was posted in Bloodstock, NL Article and tagged american pharoah, Bob Baffert, boyd browning, coolmore, fasig-tipton saratoga sale, gainesway, indian creek, lael stables, larry best, m.v. magnier, medaglia d'oro, oxo equine, Robart Masiello, summerfield sales by Joe Nevills. Bookmark the permalink.